Whew. Yeah, that is about the best word to describe the last few days for both my wife and I. But the good news is that, barring any unforeseen issues (ahem...yeah, we are talking about a boat) we should be back in the water tomorrow. After pulling the cutlass bearing sleeve the other day, I needed to wait for the yard shop to open up so we could press out the old bearing and press in the new one. 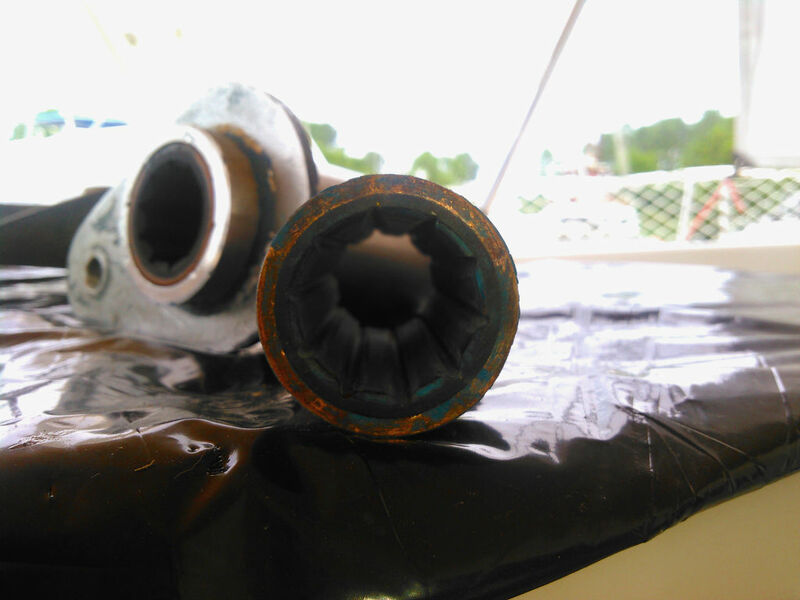 I have to admit, I do like the fact that the bearing holder unbolts from the boat and slides can be pulled out. Being able to take the sleeve holding the bearing to the shop and use a press to pop out the old bearing makes that a breeze. Old cutlass bearing removed and new in the holder. Once the old bearing was pressed out, I cleaned up and inspected the holder. The previous bearing wasn't the phenolic sleeve bearing that is called out for in the manual but was a bronze sleeved bearing. There was some corrosion in the holder, but thankfully it was still in pretty good shape. We pressed in the new phenolic sleeve bearing and I headed back to the boat. I then used a drill to create a dimple in the bearing for the set screw and then installed the set screws with some Locktite. The assembly was now ready to install. Installation of the bearing holder was surprisingly easy. I thought, given how difficult it was to extract, putting it back in would be similar. But, after cleaning the holder as well as the shaft log where it resides, it slid into place with only minimal resistance. There was a fair amount of debate on the use of any sealant during the install, but I decided to put a small amount on the back of the flange just as it was when I removed it. I also used a rubber mallet to make sure the holder was seated properly along the bottom edge since there was a possibility that using the bolt alone to seat the holder (or some combination of it and the sealant) might cause a slight mis-alignment. At least theoretically this could have contributed to the encountered wear, so the mallet seemed like an easy solution to a problem that might or might not have existed. 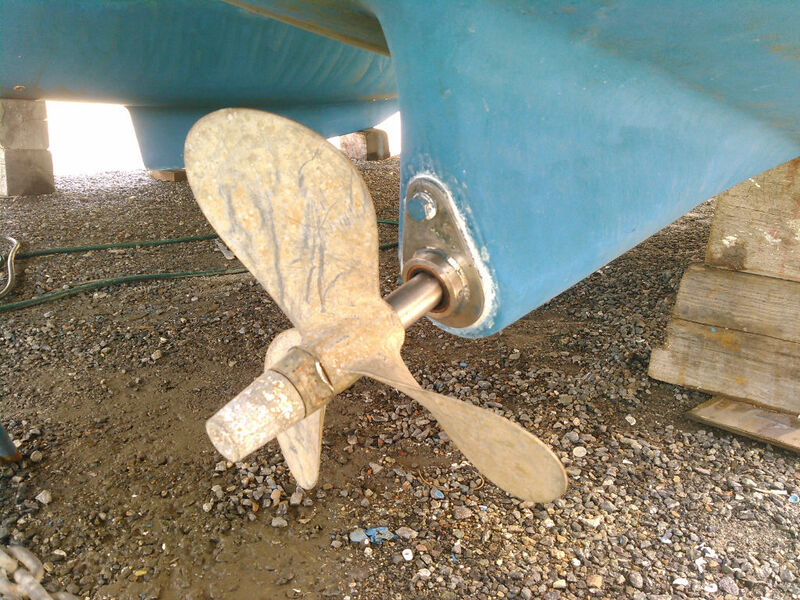 Propeller installation was very straight forward. I cleaned all the metal contact surfaces to ensure that the prop zinc takes the corrosion before the bronze propeller or stainless steel shaft does. I'm actually a bit surprised about all the bronze and stainless touching as I would think that would lead to dissimilar metal issues. A stainless steel prop shaft, stainless steel key, bronze prop, stainless steel locking washer, bronze prop nut, and a stainless steel screw that holds on the zinc. I guess that zinc must work well. With the through hulls, cutlass bearing, and propeller installed, there were only two tasks left. First, I needed to reconnect all the hoses to the through hulls. It had been several days since the sealant was applied so everything should be about as cured as it was ever going to be. I ended up buying two boxes of AWAB stainless steel hose clamps to replace a bunch of the cheaper, rusting, hose clamps that were removed. I like these clamps because they are high-quality stainless, seem to be well constructed, and are designed so they don't cut into hoses like standard clamps do. Unfortunately the down side is they are a bit pricey compared to standard hose clamps...but I think well worth the difference. I also needed to replace one hose as the new valve required the hose to be about an inch longer. So, other than a couple of the black water hoses (a system we still need to investigate a couple issues with...thanks to the last boatyard), the "plumbing" should be back in working order. The last task is to touch up the bottom paint. Pulling through hulls out required the hull be cleaned around the through hull location on the hull so the sealant will do what it is supposed to do (unlike what was done with the air conditioner through hulls). This results in the need to repaint around the areas. Of course, the smallest amount of bottom paint you can get is a quart, and after using about a half-pint to touch up the areas, we ended up touching up the keels and the waterline since they can usually use a little help. Interesting thing about bottom paint is that it apparently fades in the water. I bought the same paint as I applied last year and the new paint was noticeably darker than what was currently on the hull. Oh well, I guess the fish won't mind and I'm not going to spend another $400 or more in paint plus a few extra days in the yard to repaint the whole thing when most of the bottom paint is in good shape and was working well. So, I think we are ready. Hopefully come tomorrow, we will be back in the water. Went to Wonderland Brewery last night, thought of you guys as we were hoisting a couple brews.